Three legs is the minimum number a thing can stand on without conflict. Three is considered a perfect number. The Triple Goddess, and Triple God, some Celtic traditions dispute the idea of pantheism, or the belief that "All God/desses are One God/dess", including the triple God/dess, and they take a more polytheistic view (or view that each God/dess are a separate entity) Personally, I'm a polytheist, although certain aspects could be traced to one deity. I guess we'll never know exactly how it was til we figure out how to time travel eh? Also referring to the Triangle of Manifestaion: The point is downwards and it represents The All, Manifest Creation, the original source of everything, Nature etc, The Triangle then branches out to the God and Goddess, where the two points meet across from each other forming the triangle. 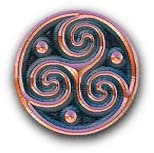 In Neo Pagan Druidry, and many Celtic Traditions, (see ADF site or Isaac Bonewits' site) the #3 also pertains to the druidic elements, realms, or virtues as some call them, which excludes fire as an 'element': Land, Sky, Sea (or earth, air, water). Also the three gates The Well, The Fire, and The Tree. The number nine is sacred because it is a triple three. Nine also always comes back to itself no matter how you multiply it. 2X9=18 and 1+8=9, 4X9=36, 6+3=9, see? If you wish to follow the Celtic path, then you could always use multiples of 3 in your practices. Chanting in multiples of three, going around the circle (Widdershins or Deosil) three times, using 3 representations of things on the altar, the number of candles lit on the altar. Things like this create celtic ambience and atmosphere in your practice. However, something to keep in mind, most Celtic Traditions (excluding Celtic Wicca) believe that casting a circle is not necessary, as sacred places are found, not created; most celebrations are on natural ground. I do not normally cast circles, but however, there is a time and place for certain things, and occaisionally I will feel the need to cast one. Reasons for this may include perhaps someone present has brought disruptive energies with them and it may disrupt the rite (It has happend! ), or perhaps the ritual is indoors, and the underlaying energies present are not very savory to one's magickal palate. Generally though, circles are only necessary if you really feel it is necessary. Go with your gut. Otherwise, find the space naturally, or create your own temple in a spot in your home and cleanse the area to make it so. The Triskele, or Triscale. Also depicted as three armored legs running connected at the thigh, sometimes with a face in the center of the three legs, and also three bent arms. Also written triskelion, called triquêtre in French. It is the Symbol the Druids (and Celtic Tradtions) use for the number 3, the triple Goddess, and the three phases of the moon. Also Earth, Sky, and Sea the three Druidic Virtues, and the three stages of life. The Trefoil, or three leaf clover, symbol of perpetuity, if green, symbol of Ireland.